Chicago’s Riverfront has undergone an overhaul in the last 24 months courtesy of increased funding and the city’s reborn initiative to blend cityscapes with landscapes. Opened last fall, the third phase of the 1.3 mile riverwalk successfully links Lake Michigan through Wolf Pointe, River Pointe, and 150 North Riverside Tower. Half a mile south, the Adam’s street bridge closed in January and is not scheduled to reopen for 13 months. The burst of new construction in Chicago can be a distraction to the maintenance required to keep a long standing skyscraper in good working order. Such is the case at 200 S. Wacker Drive, where the 15th story mechanical room was in need of a mechanical renovation. The City Department of Transportation (CDOT) approved the project with certain stipulations. The elevated street could not be closed during regular business hours. The project needed to be completed on a Sunday, to minimize foot traffic from nearby Union Station. Dearborn Engineers & Constructors provided comprehensive Ground Penetrating Radar report to determine precise outrigger locations. Shown right, Lower Wacker Drive was fortified with shoring to support the 350 Ton capacity crane overhead. GMK 6300L Crane Operator, Tim Cahill, successfully pinpointed his crane with no margin for error. 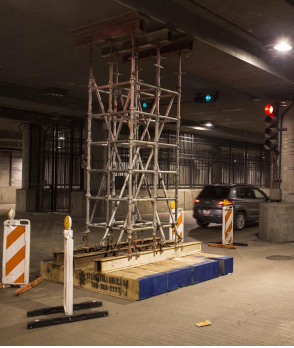 Shutting down one of Chicago’s busiest roadways meant performing dozens of crane picks with extreme attention. 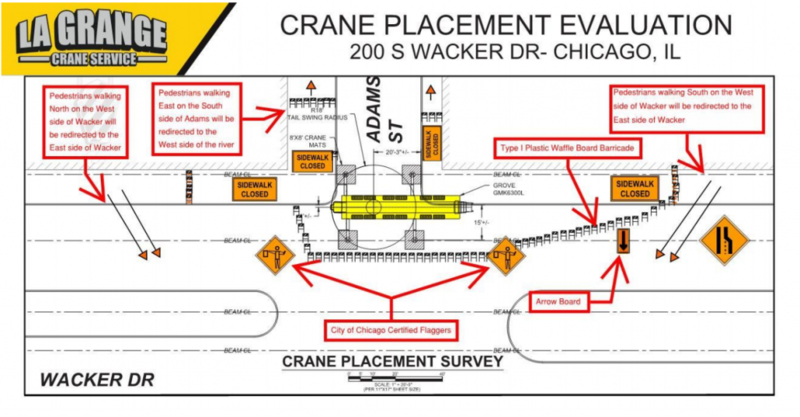 La Grange Crane procured the street closure permit and traffic control services to keep routine drivers undisturbed. Fourteen hours later, street signs were gathered and all three committed contractors congratulated on a job well done. The following morning thousands of vehicles resumed their routes and commuters continued their walks down the beautiful waterfront. Business as usual, in Chicago.